One of the fun and exciting parts of the Carle Museum is our Collections and Exhibitions team working to make our exhibitions more interactive and inclusive for audiences of all ages. Our exhibition A Marriage of Artistry: Leo and Diane Dillon, on display this past May through November 2018 included a drawing activity that encouraged creating a shared piece of art. Part of what made Leo and Diane Dillon special was that they were partners in both life and work. They met while in art school and from then on worked together as both a couple and in their artwork. The books produced by the Dillon’s were created together, each taking turns working on the art for a page until it became unrecognizable to even them who did which part of the final piece. Diane says, “We came to the concept of the 'third artist,' which was the combination of the two of us doing something that neither one of us could do separately. We would look at a piece after we finished it, and it'd be impossible for us to figure out who did what” (Diane and Leo Dillon by Saundra Marcel for the American Institute of Graphic Arts). Going off of this idea of a “third artist” we set up a large table with two drawing easels on turntables. 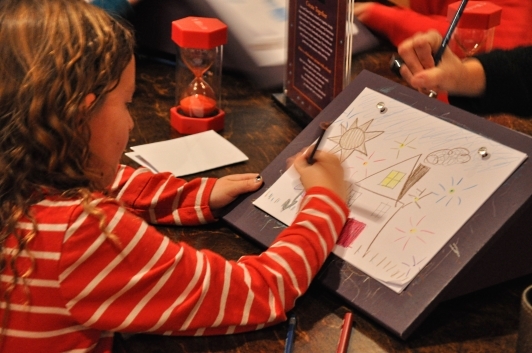 We encouraged guests to sit across from each other and take turns working on a drawing using an hourglass to time one minute intervals between turns. Guests could either choose to talk with each other about their shared drawing or to stay quiet and surprise each other with each turn of the artwork. What became an unexpected outcome of this interactive part of the exhibit was collaborations that crossed significant age lines. Often adults would sit their children down to work on the activity but when encouraged by our staff to sit down across from the child it brought out both joy and excitement in each to create a piece of art together, not just side by side. Using colored pencils or just regular lead pencils guests were able to create art together, just like Leo and Diane Dillon. This entry was posted on Wednesday, January 16th, 2019 at 9:00 am and is filed under Drawing. You can follow any responses to this entry through the RSS 2.0 feed. You can leave a response, or trackback from your own site.